Joshua just turned five, you guys. Five feels so huge! 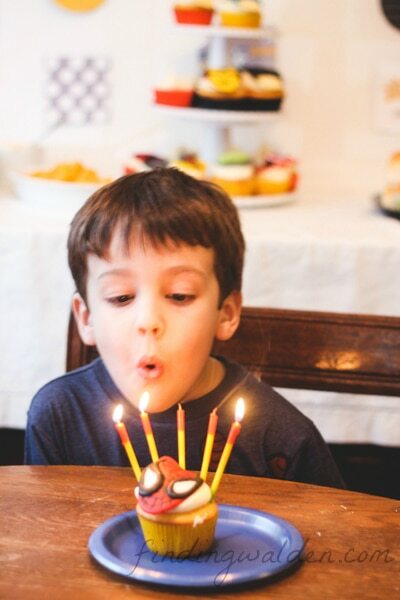 It really feels like just yesterday I was planning his Super Mario Super Birthday Party but no, nope. I was recently tasked with planning a FIFTH birthday party. 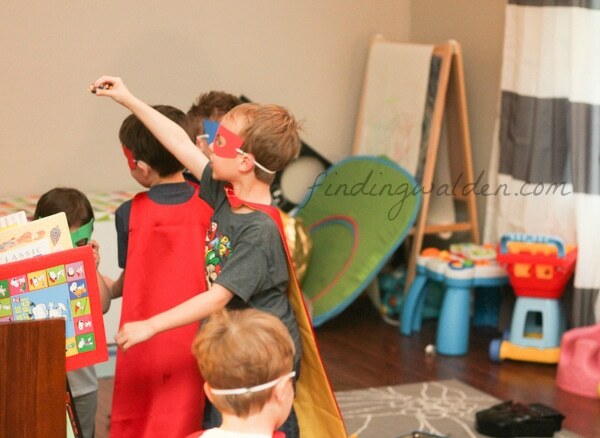 When I asked Joshua to pick a theme for this year’s birthday, he asked for a Superhero birthday party. Technically he asked for Avengers, but I like to put a personal spin on things and buying party packs doesn’t really let me do that. 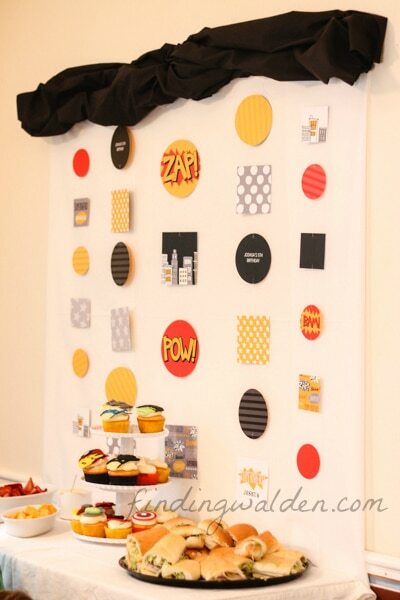 And then I fell into full on party planning psychosis on Pinterest and we started the busiest month ever. EVER. While I was browsing the Pear Tree site, I saw that they’ve recently launched a line of kids’ party decor and scoped it out. 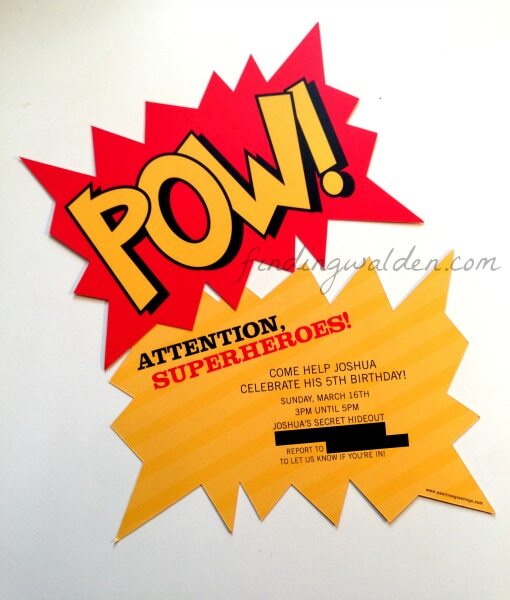 I found kids party decorations that matched the superhero invites and a coordinating set with a slightly different style. I bought them both and threw in some favor tags for good measure. 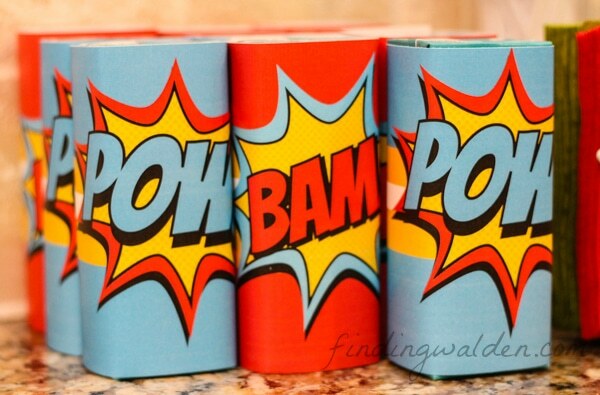 In the midst of my party planning psychosis, I had wandered over to Etsy and bought a graphics file of comic book sounds. 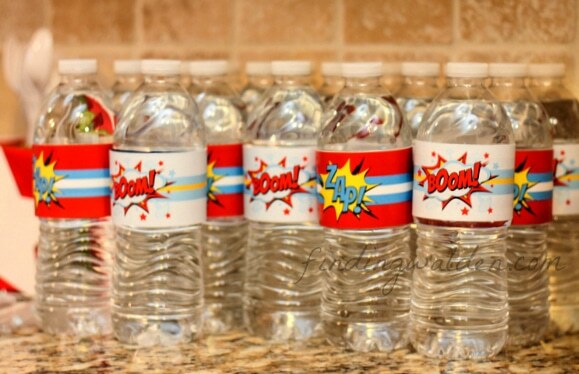 I used PicMonkey to make juice box and water bottle labels. I sent them to my local FedEx Office for printing and used glue dots to affix them. 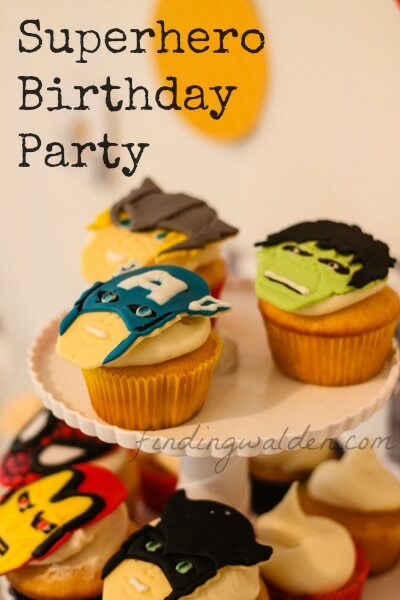 While I was over on Etsy, I also stumbled upon these Avengers fondant cupcake toppers from seller Top My Cupcake. I bought them faster than you can blink because 1) they are AMAZING and 2) semi-homemade party and 3) AVENGERS. 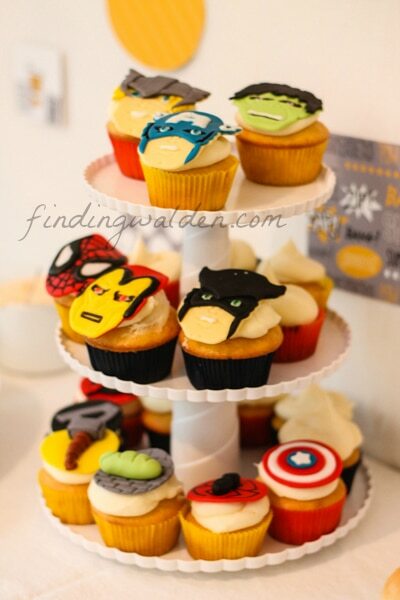 The cupcake toppers arrived super quickly and were in excellent shape. I kept them refrigerated until just before it was time to put out the cupcakes on Sunday. The fondant was delicious. Seriously. Take a look at these! 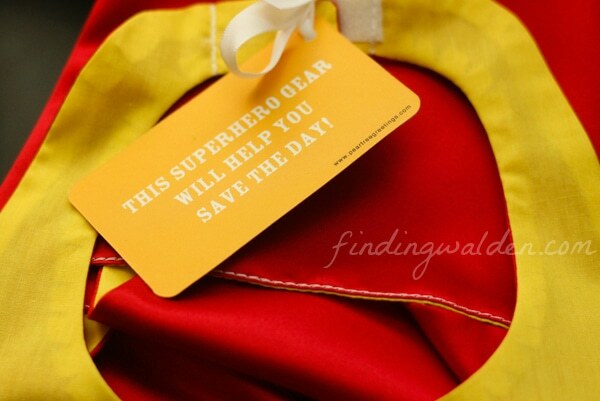 For fun and favors, I roped Mama into helping me make capes and masks for the kiddos. And by “helping” I mean I called and pleaded with her to do it for me because NO TIME BUT SO CUTE. We picked color schemes for each Avenger and made capes to represent them. This cut down on the time and cost associated with appliqueing each character’s emblem on the back. 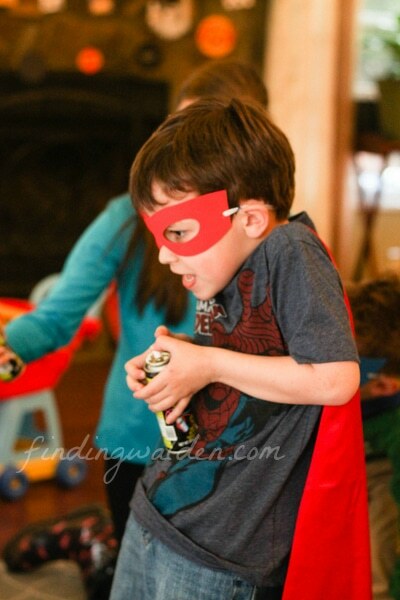 As a fun activity for the four 5 year olds at Joshua’s party, I had the idea to let them shoot silly string at one another like Spider-man. I also wanted to take a bean bag toss board and make it a Superhero bean bag toss game. But the weather did not cooperate and neither did my time allotment or my budget. So that is how it came to be that 5 year olds were shooting silly string INSIDE MY HOUSE. The games were combined and fun was had. Only two adults had to leave the room to avoid hyperventilating about the mess these kids had a blast making. Of course Emma the Tiny Destroyer chose the Hulk cape. 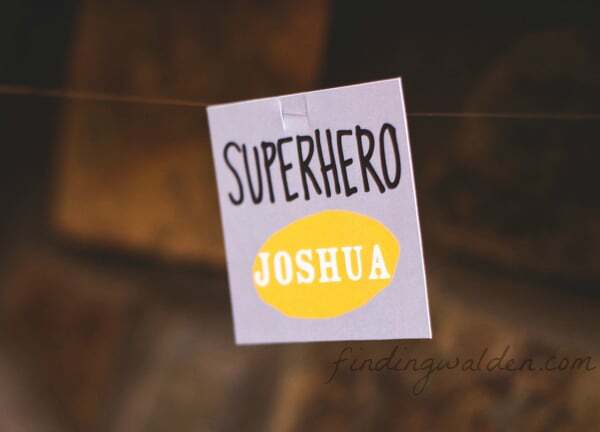 Joshua chose Spider-man. We also had Thor, Ant Man, and Ironman. Batman made an appearance but his portrayer decided to go as Bruce Wayne instead. 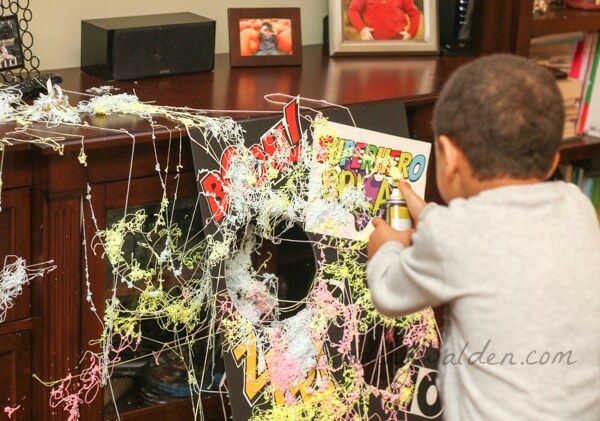 This silly string might LOOK messy, but it cleaned up really easily. I let it dry just a little bit and then it wiped/swept right up. It didn’t stain the rug or anyone’s clothing and was really, really fun. 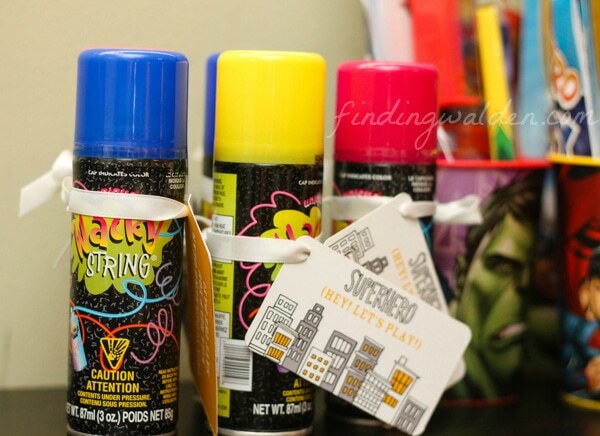 I even caught a few adults sneaking sprays of silly string, at their kids and at one another. 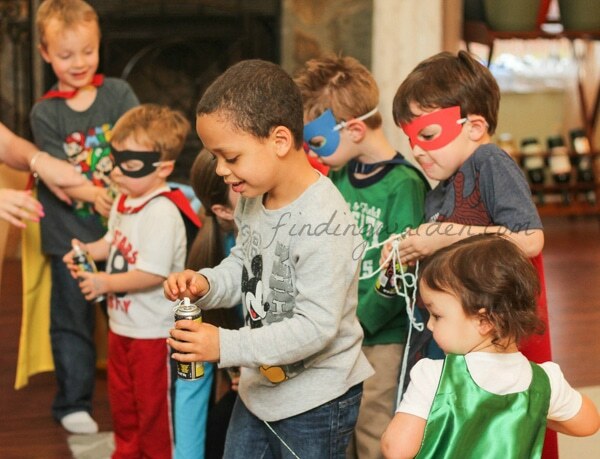 When the Superhero Silly String Shootout was over, the kids headed into the playroom to play with toys. Then it was time for cupcakes! Absolutely nothing about this picture is in focus, but MY KID IS FIVE. Much sniffling! We were NOT allowed to sing “Happy Birthday” or say “Yay” or clap or anything other than watch him blow out the candles and then eat our cupcakes. Testy 5 year olds are testy. 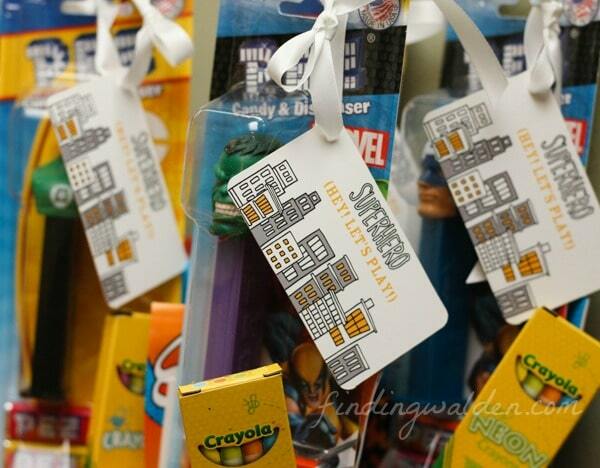 After the kids played a little more, it was time to grab their party favors and go. Thanks to Target Dollar Spot and Amazon Prime, these came together for about $5/each. Each contained: a pair of Avengers socks, a Pez dispenser, a cup, an activity book and a 4-pack of crayons, some Avengers temporary tattoos, and some stickers. 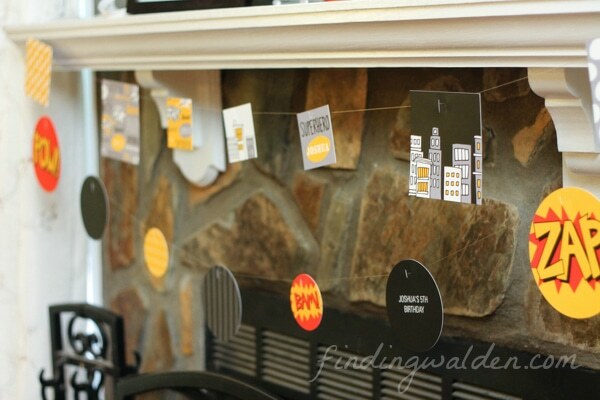 Here’s my defense of the party favors (and a picture of the super cute tags from Pear Tree Greetings). There were threats of tears. While some decry the party favor trend, I’m a fan. 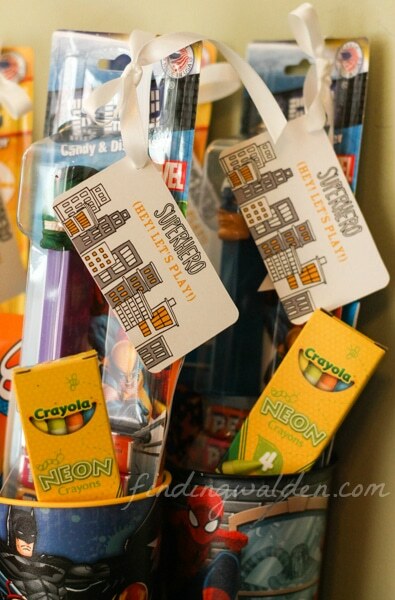 The party favors helped usher the kids out the door with a little bit of distraction and a lot less waterworks. I’m a Pearista with Pear Tree Greetings. 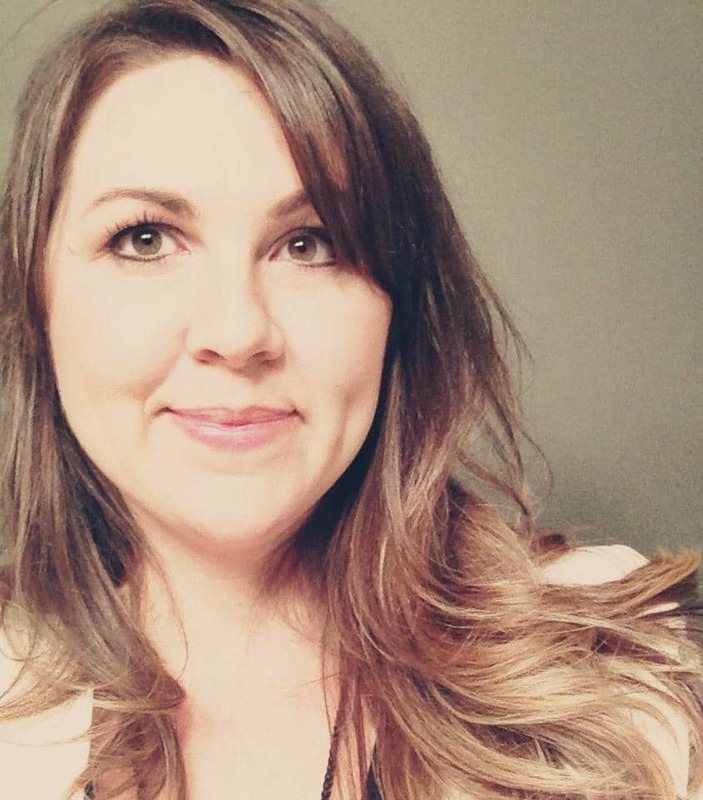 The Pear Tree products featured in this post were sent to me as part of our partnership. I love, love, love Pear Tree Greetings and their commitment to helping people tell stories and am excited to be working with them this year. I didn’t know there was an anti-party favor movement. Like you I think it offers a little distraction to kids who may get a bit jealous of the gifts the birthday kid is receiving or like you said may need a distraction to get out the door. The favors usually get junked within a week or two of the party so it’s no big deal to me. Regardless, you did a fabulous job on his party. Great job, momma! SO fun! What a great party! Happy Birthday, Joshua!